Sit out on Lucille’s deck at night and you can enjoy a sky studded with twinkling stars. 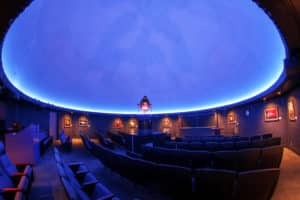 It’s a great way to whet your appetite for a visit to the O. Wayne Rollins Planetarium, a trip that can add depth to what we view when we look skyward, and give us a whole new appreciation for celestial beings. O. Wayne Rollins Planetarium is located on the campus of Young Harris College, a school founded to bring advanced educational opportunities to people in the remote areas of the Blue Ridge Mountains. 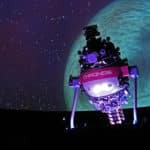 Here you can explore the sky via the planetarium’s Chronos Space Simulator and a full-dome projection system that’ll make you feel so close to the stars you could almost touch them. March 22 at 7:00 p.m.
An exploration of the trio’s inter-relationship and their effects on our lives. March 22 at 8:00 p.m.
A traditional star show, highlighting constellations, planets and stars currently visible over our state. April 26 and May 3 at 7:00 p.m. and 8:00 p.m.
Full-dome computer animation mixed with classic rock music from the 60’s through the 90’s to explore the evolution on rock history. Visitors to the area can also stop by the College’s Observatory, located about 1.5 miles from campus near Brasstown Baldy, Georgia’s tallest peak. A main telescope is housed in a 15-foot dome, offering outstanding viewing of clear night skies. Starry nights are among the many joys of a getaway to Lucille’s Mountaintop Inn & Spa. And one more reason you’ll want to plan a visit soon! Call today to make your reservation or book your stay online. Images courtesy of O. Wayne Rollins Planetarium. This entry was posted in Georgia Bed and Breakfast, Georgia Mountain Activity, Georgia Mountains, Mountain activity and tagged Georgia Bed and Breakfast, Georgia Mountain Activities, Georgia Mountains, North Georgia B&B, North Georgia Mountains by admin. Bookmark the permalink.